As I’ve mentioned before, our former work coffee club is a big fan of big coffee, so it’s no surprise that this week’s coffee has managed to become something of a regular. Talyors Hot Lava Java is a strength 6, “high caffeine” coffee. The grounds themselves aren’t as dark as you might expect, but the aroma certainly packs a huge punch. It’s full of rich, deeply roasted beans without any hint of singeing, a hint of bitter dark chocolate and just a whiff of tobacco. Once brewed, there’s more of a spiced wood aroma along with a background of dark muscovado sugar. In the mouth, it’s a seriously strong coffee; a big, rich mouthfeel, rich roasted flavours with just the barest undercurrent of caramel and a balanced but assertive bitter finish. 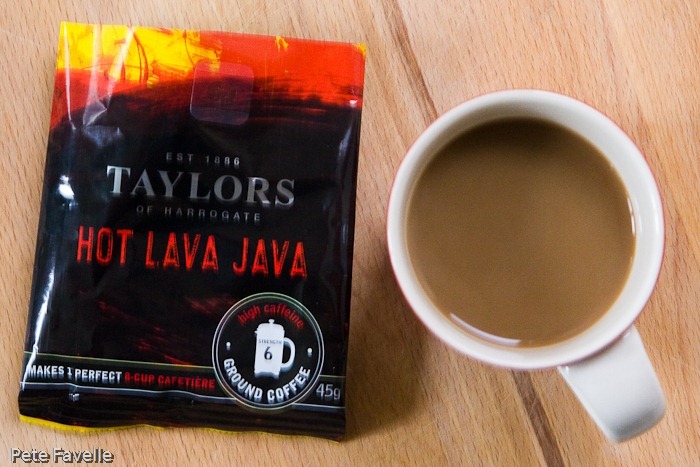 With a very strong score of 7.4 out of 10 at work, Hot Lava Java earns 3.5 stars here – a great coffee, as long as you like it strong!